Wolfgang Schäuble, April 2016. Photo: CHLietzmann. via Flickr. First published at Flassbeck Economics. The most common claim in the German press about Wolfgang Schäuble’s eight years as Germany’s finance minister appeared again in the business daily Handelsblatt on Monday morning: “He saved the euro states and consolidated the budget." That is to say: he was a German Hercules who saved entire nations and worked wonders in the financial-political sphere that have never been seen before. Let’s start with Europe. The outgoing federal minister of finance, more than any other German finance minister before him, must be held responsible for the economic developments in Europe. As a European financial and political heavyweight, and in view of Germany’s unique historical role as a creditor for the whole of the EU, he dominated the Euro group and set the agenda for the so-called rescue of crisis states. The results were and continue to be catastrophic! If one compares the economic development of the euro area after the global financial crisis with the only comparable economic area, the United States, the eurozone’s “performance” can at best be seen as inadequate. Even if we consider such a dubious benchmark as GDP, since 2012 growth in the euro-zone economy has remained more than five per cent below what it could have achieved if it had grown as strongly as the United States. In other words, if the EU economy had grown as much as the US since 2009, European GDP today would be well over EUR 150 billion higher than the current figure. This is a considerable shortfall, even for such a large economic area. The simple reason is that, following a recovery comparable to that of the US recovery immediately after the global financial crisis, European economic policy changed tack in 2011 in an attempt to overcome its own crisis, with a fatal mixture of austerity and “structural reforms." According to official figures, today’s unemployment rate in Europe is still nine percent, while in the US it is approaching historical lows of well below five percent. Unemployment levels throughout southern Europe, including France, are still extremely high — and this is not due to the encrusted labour markets but solely to low growth momentum. Europe is not only suffering from low growth and high unemployment; it has also failed to meet its inflation target. The European Central Bank (ECB) has been fighting deflationary trends with zero interest rates for years. This is heavily criticised in Germany, but at the same time we Germans do not want to believe that it was German wage deflation under the Social-Democrat/Green coalition that sowed the seed of deflation in the eurozone. This means that all the region’s macroeconomic goals are far from being achieved. Germans will object to this assertion, explaining that in Europe there were “structural” problems, excessively high government debt, and a lack of competitiveness. That made it impossible to solve the European economic crisis as easily as in the United States via macro-politics. But this is exactly where the real problem with Wolfgang Schäuble begins. He immediately adopted the theory that the financial crisis was caused by “excessive public debt," only later adding the “lack of competitiveness of the southern European nations." Both analyses were wrong. Already in 2009, Mr Schäuble’s first year as German finance minister, an honest analysis would have revealed that the enormous gap in competitiveness among EU countries is largely due to German wage dumping initiated under the Social Democrat/Green government. 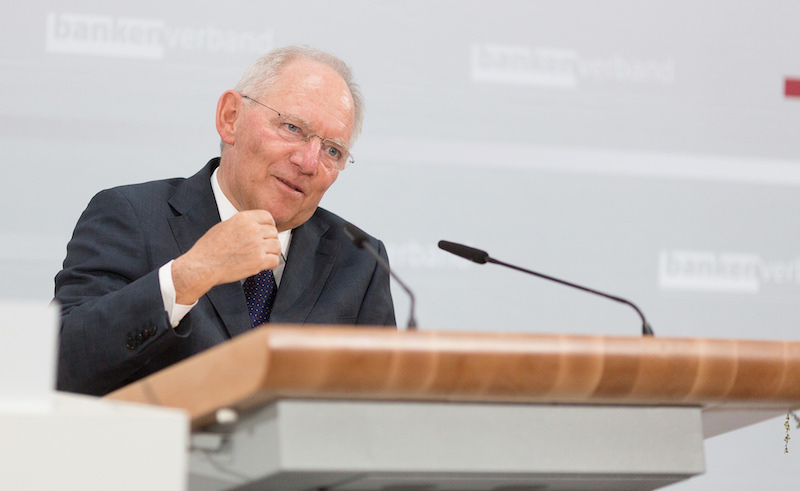 Mr Schäuble should then have focused on the burgeoning German current account surplus. He should also have recognised that it was impossible for the other euro nations, which were running current account deficits and whose companies were reducing investment, to consolidate public finances without falling further into recession. The adoption of an austerity policy at the beginning of the global economic crisis was simply absurd. Consequently the provisions of the EU’s Stability and Growth Pact should never have been so restrictive and no attempt should ever have been made to comply with them. Long before 2015 it should have been clear that no state could adhere to these targets without causing enormous economic self-harm and slipping deeper into crisis. More importantly, the Euro group had also urged its member nations to “make labour markets more flexible” to combat the crisis, which meant reducing wages to “improve competitiveness." This however led to a sharp decline in domestic demand, resulting in a further increase in unemployment. The Euro group and Mr Schäuble had expected exactly the opposite. Mr Schäuble should have been aware of this cause and effect. And he should have fought accordingly for a change in German economic policy. That would however have meant convincing the population that for a nation with a high current account surplus, whose business sector was radically reducing its investment, and in the midst of the euro currency crisis, any attempt at consolidating the budgets of the euro nations was absurd. With a responsible and knowledgeable finance minister at the helm the mechanism for putting a brake on public borrowing would never have been adopted into the German constitution. Apparently the man who held the fate of Europe in his hands for eight years believes that his advisers (his officials and the infinite number of “experts” in the central banks and international organisations) are always right, and that it is therefore best if the politician simply follows their advice. Obviously it never occurred to Mr Schäuble that his advisers might be fundamentally wrong. That is exactly what happens when you give a lawyer such an important economic policy position: he is deeply impressed by the “wisdom” and knowledge of his advisers and cannot carry out his political task of protecting the German and European people from a ruinous economic policy. But Mr Schäuble goes even further — and this is frankly shocking — by claiming that you can communicate better if you know less. Up to now we were under the illusion that only those who really understand every detail of policy can communicate it in a credible and perspicacious manner. Now we learn that too much knowledge can be a dangerous thing. Why? Would it then no longer be possible for a finance minister to tell his voters that everything is going splendidly in Europe, although in reality things are only slightly improving? Would it be more difficult to declare that government debt is calamitous? Could Southern European nations no longer be blamed for the defects in the monetary union? Now that it is too late, we finally know why Mr Schäuble never explained to the German public how monetary union works. Now we know why he never even tried to think of government debt in relation to savings and other sectors’ debts. Now we realize that it was sheer ignorance that drove him to follow the international institutions blindly when it came to “making labour markets in southern Europe more flexible." It is a pity that we are learning this only now, at the last moment, though we could at least learn something from it. Not only that Germany and Europe have eight lost years behind them, but also that the next German finance minister must be more able than his predecessor. The most important rule for the future is to remember that lawyers can’t do everything, even those who like Mr Schäuble are the sons of a Swabian Housewife.